Tolo News: At least two Taliban fighters were killed and three others wounded after ambushing a convoy of four fuel tankers in Chashma-e-Sheer area in the north of Pul-e-Khumri city in northern Baghlan province on Thursday morning, local officials confirmed. 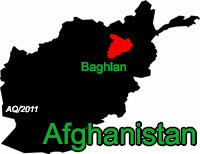 According to the drivers of the tankers, a group of Taliban fighters fired rockets at them. Two tankers were hit – both of which burnt out. Click here to read more (external link). « Private military contractors aren’t going to do a better job in Afghanistan. Here’s why.